This is a follow up to the article on teaching kids to code. The purpose is to document the steps needed to get a TRS 80 emulator up and running on Ubuntu 14.04. I had to do this recently and am writing down the steps so I don’t forget them. In order to run the sdltrs emulator, it must be compiled from source using a Makefile. (Did I mention makefile training was valuable?) A ROM file must also be downloaded because sdltrs does not include one. Finally, an appropriate command must be issued to use the downloaded ROM file. 2) If you do not already have the SDL development library install it with this command. 3) Compile sdltrs by typing make in the src/linux subdirectory. I ran into the following error. As a result, I had to modify the Makefile under src/linux. I changed the LIBS line to add a dependency on X11. 4) Download a Model III ROM file by clicking here. It is convenient to copy the ROM file to the same directory where the sdltrs executable is located. 5) The emulator is started from the command line. Here is a sample command line. Read more about the command line options here. The best way to learn is to start working with your computer. If you are a programmer of a certain age your first programming experience was probably typing BASIC statements into a computer with an 8 bit CPU. It could have been an Apple II, TRS 80 or even a Commodore 64. If you wanted to learn how to program the choice was already made for you. There was BASIC or there was BASIC. Personally, I started out in elementary school on an Apple II. I then saved up any money I had from birthdays and other gifts and bought a TRS 80. It presents a problem though, if you want to teach kids to code. You will have to pick a language. It is unlikely to be as approachable and accessible as the BASIC prompt. I’ve been reading up on the choices that are out there. I have put together this list. Efforts have been made to devise curriculum to get elementary students interested in programming. You can also download a special issue of the PragPub magazine that contains articles about teaching kids programming. There is also a video of a talk about teaching a five year old to code in Ruby. Lately, I’ve been thinking that the best way to teach a kid to program may be to get back to basics. That is to say, BASIC on a TRS 80. It could just be nostalgia, but it is entirely possible. There are TRS 80 emulators that will run on that $199 Linux dev machine. 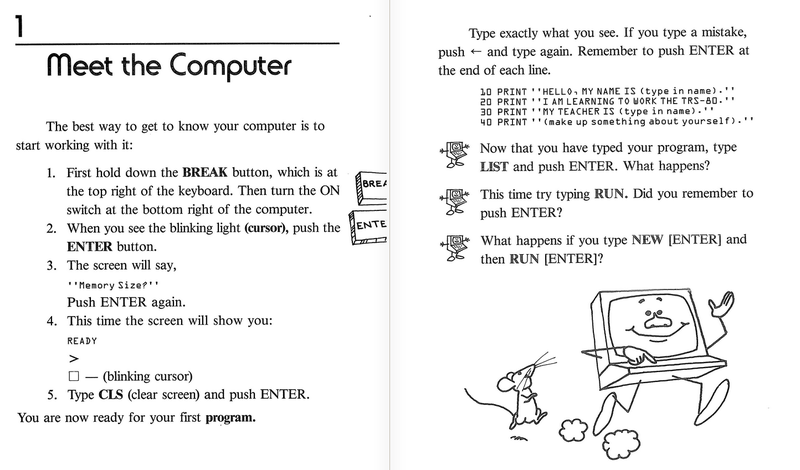 Thanks to the internet archive, there are also books that teach kids how to work with computers. Check out the entire collection. Computing doesn’t have to be reserved for a special class of people. The key is to encourage kids to jump right in and start getting to know their computer.